John Neumann was born in Prachatice in Bohemia (now the Czech Republic) on March 28, 1811. He studied theology in the seminary of Budweis. Zealous for the missionary life and to lead souls to Christ, he decided to leave his homeland to dedicate himself to the European immigrants in America, who were deprived of spiritual support. Neumann was ordained a priest by the bishop of New York in June 1836, and gave himself to the pastoral care of people in the vast area around Niagara Falls. Wanting to live in a religious community that corresponded more to his missionary vocation, in January 1842 he entered the Redemptorists. A tireless missionary, Neumann busied himself in particular with the German immigrants, first in Baltimore, then in Pittsburgh. Having filled the role of vice-provincial superior of the Redemptorists from 1846-49, he became the parish priest of St. Alphonsus Church in Baltimore. In 1852, at the age of 41, he was named bishop of Philadelphia. Neumann had a strong effect on the religious life of the United States by founding Catholic schools and promoting devotion to the Eucharist. He founded a new religious institute—the Third Order of Saint Francis of Glen Riddle. The School Sisters of Notre Dame likewise regard Neumann as their secondary founder, their “Father in America.” In just seven years, he built 89 churches, as well as several hospitals and orphanages. As a bishop, Neumann was untiring in visiting his vast diocese. 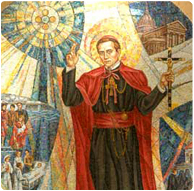 St. John Neumann is invoked as a patron of sick children and of immigrants. God of the Journey, through the intercession of St. John Neumann, patron of immigrants, we pray for those who leave their homelands longing for freedom and new opportunities. May they recognize you as their traveling companion and find a welcome awaiting them. We make this prayer in the name of Jesus. Amen. O Jesus, who on earth commanded and practiced a hidden life, grant that in these our days of pride and outward display, the example of your servant John Neumann may lead us to follow your humble ways. Grant, O Lord, that like your holy bishop we may do all our work with the pure intention of pleasing you and let not our deeds be done to win the favor of others but to give glory to our Father in heaven. We thank you that our fellow citizen and devoted missionary bishop is recognized among the saints of your Church in heaven, and we beseech you, O Lord, to glorify him on earth by granting the favors we ask through his intercession. Amen. The National Shrine of Saint John Neumann is in Philadelphia.